I’m delighted to be able to say that I shall be a Visiting Research Fellow at the Moore Institute of the National University of Ireland at Galway in 2015. Here are some details of what I plan to get up to. The task of understanding what constitutes the nation in the web archive is only in its infancy. Web archivists in national libraries have long known that top-level domains such as .uk or .ie do not encompass all the content that should be considered British or Irish for the purposes of analysis. But even the task of understanding the shape of those top-level domains has only just begun. My project begins that process for the Irish web. One of the live questions about the nature of the national web is the degree to which it interacts with other national domains. This is of particular interest in the Irish context, since many institutions on the island of Ireland interact in cyberspace in ways that do not respect the physical and political border between Northern Ireland and the Republic. This pilot study will begin to examine this interaction by the triangulation of analyses of data available from the Internet Archive and from the British Library. 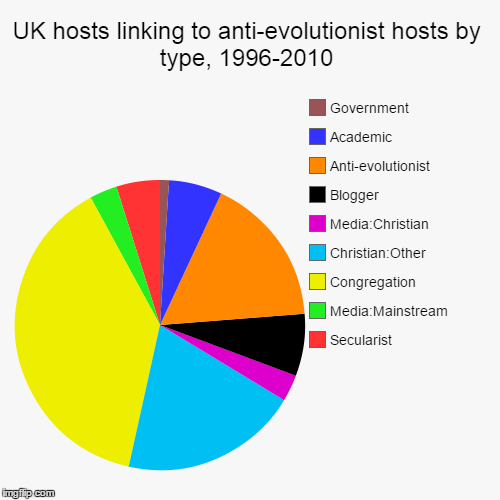 In particular, the data from the British Library lists all of the outbound links in the .uk webspace for the period 1996-2010 (see this earlier post). Such a dataset does not exist for the Irish webspace, but by analysing the composition of links from .uk sites to those in the .ie domain, it will be possible to read the growth and composition of the Irish webspace in its reflection in the UK. It will also shed valuable and hitherto unseen light on one aspect of the relation between the UK and the Republic of Ireland. The initial outputs will be a series of small case studies, documented on this blog. Over time, these will be synthesised into an appropriate article or articles. I also plan to make subsets of the data available for reuse by other scholars. The Big UK Domain Data for the Arts and Humanities project has shown an appetite amongst humanities and social sciences scholars to understand the content of web archives, and also to understand the methodological implications of working with what amounts to a new class of primary source. I intend to use the period of the Visiting Fellowship to engage with scholars across the humanities and social sciences at NUI Galway and in other Irish universities, with a view to sowing the seeds of a community of scholars interested in exploring the archive of the Irish webspace.